The group lets there folkie and frontiersmen come to the forefront on this night in Colorado. What needs to be addressed first is the amazing quality of this recording...it is an A++ thanks to Charlie Miller, Rob Eaton and company. It sounds perfect, there is no two ways around it. While this isn't a complete show, the quality of playing and sound won't disappoint anyone who wants to take this trip with me. The first three songs almost act like a history lesson from the group. Then comes the cosmic freak out folk of the fan and band favorite "Morning Dew". This version is raging all over the place with huge crescendos a quick tempo and what could be sheets of metal getting played about midway through, this is a fun sonic journey. 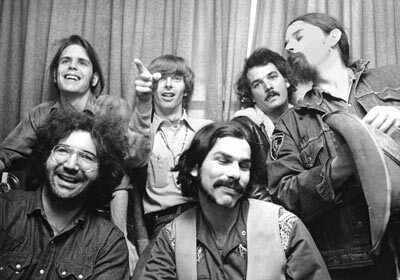 What shows up next is an amazing Jerry Ballad worth every second it is played, "High Time" aches with pain making Jerry sound older then his years on the vocals, and the group supports him well, Lesh in particular plops in with some creative bass lines. A quick and cut off "Me and My Uncle" keeps the cowboy vein a flowin' for Bobby and has some nice keys from Pigpen. Then comes the highlight of this short first set, the wandering long version of "He Was A Friend OF Mine". Turns out this tune is actually a combo of a traditional ballad and a piece of Mark Spoelstra's song titled "Just a Hand To Hold", there is a pretty good round up on the tune here. Also some more discussion here on it. Whatever it's origin the Dead make it their own on this night with a spacious jam section that finds Garcia soaring. This version seems to be the longest the Dead ever recorded of this song and the guitar intro is pretty magical all around. The band strolls and takes a leisurely walk in the summer night with this one watching the sunset and contemplating life as Jerry plays on and Phil starts the musical conversation that Bobby picks up as well. This is a unique track and one worth checking out if you never heard the Grateful Dead play it. Hope you enjoy this set as much as I did, thanks again to the production team as this sounds pristine and will obviously get many return visits. Vaya Con Dios Amigos.